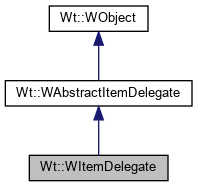 The default implementation returns a WLineEdit which edits the item's Wt::EditRole value. The DisplayRole data is converted to a string using asString() by passing the given format. When the flags indicates Wt::RenderEditing, then createEditor() is called to create a suitable editor for editing the item.